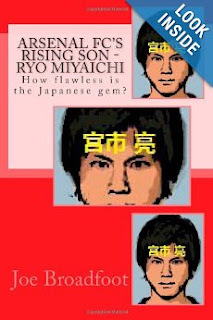 Ryo Miyaichi certainly needs an injury-free spell (nothing to do with witchcraft!) if he's going to establish himself at Arsenal. Already this season, he's been out with a rib injury. Then more recently, he's had ankle problems. The ribs are a one-off, but his ankle issues are recurring and therefore worrying. However, as I've pointed out before, a certain Robin van Persie became a Robin reliant as he put his injury curses behind him. It was a long-haul trip but well worth the wait until he headed off to Old Trafford. Hopefully, Ryo will simply grow stronger and remain a loyal servant to Arsenal. He certainly has the attitude and skill to make it, so let's hope Lady Luck is on his side.